Housing Market Update: Prices Remain Weak Due to Foreclosure Scandal. Last week, I reported that mortgage rates have declined to another record low. Unfortunately for the housing market, the resulting uptick in mortgage activity was dominated by refinancings, and there is little evidence that low rates are spurring new borrowers. 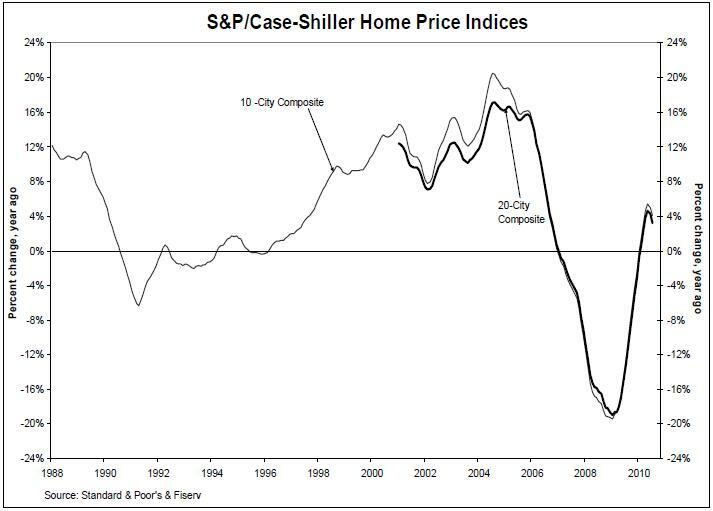 This is confirmed by the updated S&P Case Shiller Index, which shows that while prices are still rising on average, they are rising at a slower rate than before and appreciation could soon turn negative. Morgan Stanley may speak for everybody; “It expects 2011 home prices to fall 5% to 10% from this year with four years of flat prices after that, although ‘the risk of slight additional downside in prices, and extension of the trough to 2012, has increased.’ ” Most of the government home-buying incentives have expired and lending standards have tightened. If the government doesn’t continue to support the mortgage industry, declines could be even more significant. The biggest variable is the ongoing foreclosure scandal, in which lenders have conceded to fraudulently processing foreclosures for tens of thousands of borrowers. As a result, foreclosure listings have been pulled until the investigation is resolved. Most analysts have argued that this will be roundly negative for the housing market, especially in depressed areas were foreclosure sales represented the brunt of buying and selling: “These delays ‘are just going to cause more chaos and confusion. At this point, this is probably the nail in the coffin for housing. I think worse times are still ahead of us.’ ” As a result, the shadow inventory of foreclosures will be unable to clear, and prices continue to fall. If you’re in the market for a home, you should probably stay away from foreclosed properties for the time being, due to uncertainties over title. Otherwise, remember that there is not one national housing market but hundreds of regional markets. Each of these markets has its own nuances, and may be governed by different trends and demographics. Some markets remain depressed, while other markets have barely suffered. [For value shoppers, Coldwell Banker compiled rankings of the most/least affordable markets]. Finally, consider that it’s still a buyers’ market and that there is certainly no rush to buy. If historic trends are any indication, prices will decline slightly as we move towards winter, a period when the market usually slows down. Update: the above link to hlr.coldwellbanker.com went offline, so I updated it to reference the current file location. Excellent piece. There are way too many red flags in many markets for most people to consider foreclosed properties. In regards to the market as a whole I feel that recovery is going to be much slower than anyone would hope. With many people either out of work or in fear of losing a job, buyers will continue to sit on the sidelines. The government incentives have helped prop up the market but until we get a handle on unemployment demand will continue to be weaker than needed to make a real recovery in housing.